As with The Luminous Sea, the cover of this lured me right in. Covers with sea creatures on them always catch my eye, so when I saw this book on the “new book” shelf at the library, I grabbed it. The whale’s blubber opened like a blossom. A bubble of exhumed insides appeared in the centre of the gash, its split mouth widening. The opening hissed. Blood emerged not as liquid but as mist. A spray of gas slapped Julie and painted her face. She scrambled back, shielded her eyes, the taste of aspirin and iron infecting her mouth. The whale’s intestines crowned in the opening, then spooled out of its body, looped in the air. Snakes of it twisted and spun. The seagulls screamed louder. Like some people desired sports cars or country villas, he desired to die. For his heart to stop seizing. For his blood to settle in his veins. For his synapses to stop shrieking. To be still and permanent, trustworthy and even. Death was shiny and smooth. A warm and still lake. In addition, a mysterious woman shows up and quickly worms her way into Marty’s life. Known as Jennie Lee Lewis (JLL), she’s a Jerry Lee Lewis impersonator and has the whole town whipped into a frenzy. When Marty goes missing, JLL thinks she knows where he might have gone. Following her hunch, the two women embark on a road trip, leaving a “trail of animal death behind them”. As they passed through town, Julie noticed that the people in Port Braid were no longer walking around covering their faces. The town no longer used oxygen. It breathed whale. The rot had settled fully into the pores of the town, a steam that softened the residents’ skin and replaced their oils with its own. With new insight into her dad’s life and past experiences, it is Julie’s inner journey that this story is exploring. What is her Dad, JLL, and the universe trying to tell her? Humans are rememberers, she thought. Appreciators. They take this job so the caribou, the dark gliding whales, the pallid bats, mean something, and so they themselves do too. Strange and unique, creative and surprising. 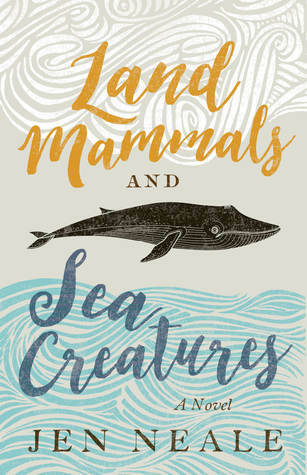 Land Mammals and Sea Creatures is a finalist for the Rogers Writers’ Trust Fiction Prize, along with Dear Evelyn by Kathy Page (my review), Beirut Hellfire Society by Rawi Hage, Washington Black by Esi Edugyan, and The Saturday Night Ghost Club by Craig Davidson. *Just after reading this book, I was listening the CBC Radio and coincidentally heard a story about a flock of starlings diving into the ground for no apparent reason. Which just makes it all the more fascinating. I put it on my wish list, like Luminous Seas, I think I might like this one because it’s hard to define. I can see why you fell for that jacket. Beautiful! The novel itself sounds intriguing. And it often pays off to fall for a book jacket! This sounds like an amazing and unusual book! Wow. Humans are rememberers is a beautiful sentiment. This sounds really fascinating Naomi – a great find! This is only her first novel, so I’m very curious to see what she writes next! I’ve got this on my shelf right now and really want to read it-especially now that it’s been nominated! So glad you enjoyed it, and the animal death aspect to it is very fascinating! I was delighted to see it was one of the finalists for the Writers’ Trust Fiction Prize! What an intriguing review. One for the TBR list me thinks! It’s definitely unique – the kind of book that has people loving it or hating it. But I like books that take me places that I’m not expecting, and admire the authors who write them! Oh, yay! I have a lot of faith in your ‘squeezing-in’ abilities. And I’m very curious to hear your thoughts on it – I’m feeling alone with this one right now. Oh, no: this is sounding very Hueberty. *winces* But it doesn’t look terribly long…. I never once thought of Huebert while reading this book – that’s weird. Maybe because Huebert’s animals are usually acting the way we think animals should? Have you gotten any further since writing this?